For Maker Camp, our virtual summer camp for teens, most of the materials for the projects use common household items, others, such as the Compressed Air Rocket Kit in the picture, can be purchased in the Maker Shed. To celebrate the launch of Maker Camp, the Maker Shed is offering free shipping on all orders over $50! Just use coupon code MAKERCAMP upon checkout to get the deal. It’s the perfect way to stock up on camp supplies or to take your new found skills to the next level. 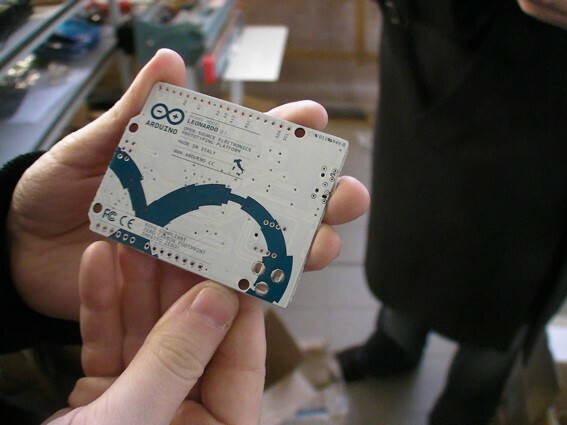 With everything from Arduino, to guitar kits, to tools, the Maker Shed has something for every maker. Want to attend Maker Camp? It’s easy and free, just follow MAKE on Google+! 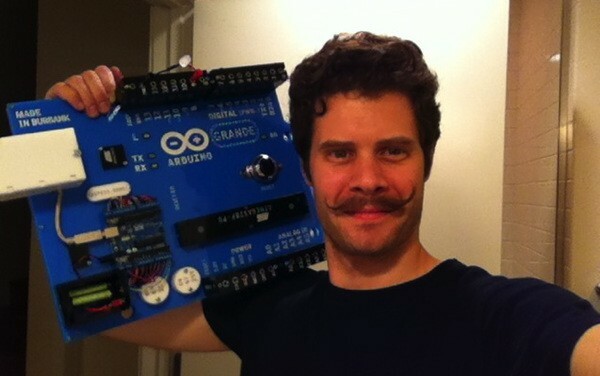 This is Make's John Edgar Park, manfully clutching his Arduino Grande. The oversized device isn't just for show though, it's a fully working unit for those projects where a standard sized PCB just won't do. He'll be taking excited modders though the process of building it at Maker Faire on Saturday, just head over to the demo stage at 5:30pm with your pre-written Super Size Me jokes close to hand. Visualized: Arduino gets super-sized ahead of Maker Faire originally appeared on Engadget on Thu, 17 May 2012 05:25:00 EST. Please see our terms for use of feeds. Jay Silver from SparkFun and Eric Rosenbaum from MIT kickstarted a very nice project, which lets you to convert almost everything into an input-device for your computer. MaKey MaKey allows you to turn almost any common object into an input-device for your computer. 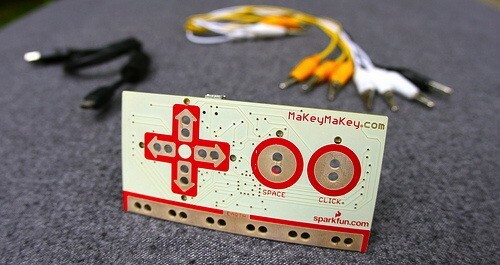 The front side of the MaKey MaKey board has six inputs: up/down/left/right arrow keys, spacebar and a mouse left-click. Using alligator clips you can hook those inputs up to anything that’s even slightly conductive – fruit, play-dough, water, pencil drawings, whatever you can dream up – which becomes a keyboard or mouse input to your computer. So you can play a banana piano, play-dough Mario, or even create custom webcam triggers. 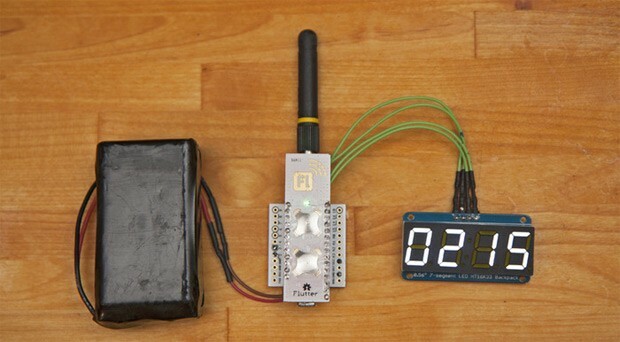 It uses the Human Interface Device (HID) protocol to communicate with your computer, and it can send keypresses, mouse clicks, and mouse movements. For sensing closed switches on the digital input pins, we use high resistance switching to make it so you can close a switch even through materials like your skin, leaves, and play-doh. A longer introduction to MaKey MaKey can be found on SparkFun, while a more comprehensive description can be found here, together with some funny videos about its use. Alasdair Allan, author of Learning iPhone Programming, Programming iPhone Sensors, and iOS Sensor Apps with Arduino, sat down with MAKE’s Dale Dougherty to talk about getting iOS devices and Arduino talking to each other. The words of an Astrophysicist turned maker! If this news isn't as obvious as John Obvious: Professor of Obvious studies at Cambridge University: we love Arduino 'round these parts. Phil and Limor of Adafruit Industries took a tour of the Italian foundry's Turin factory and took a gallery of pics (and video!) on the way. It's a great insight into how the building process works for the modding tool, and you can head on down to our source link to check out the gallery in full -- we've also included a direct link to the video as the guys walk down the production line in our more coverage link. We're so good to you, you know. Roll up, roll up for the magical mystery Arduino tour originally appeared on Engadget on Fri, 13 Jan 2012 08:44:00 EST. Please see our terms for use of feeds. 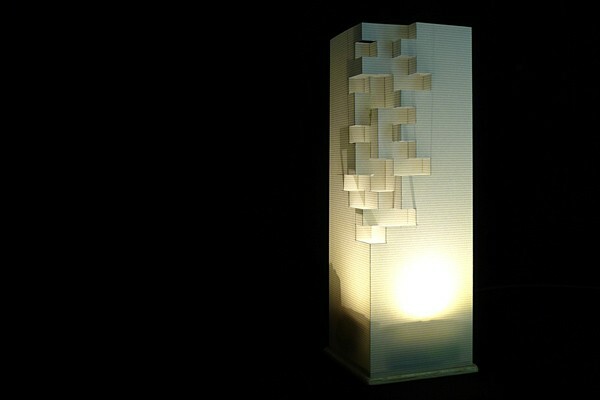 A DIY lamp may not sound like the most thrilling project on Earth, but the Luminch One is special. Not only does this hand-made light from Francisco Castro provide illumination -- the most important function of any lamp -- but it does so while looking beautiful and providing a level of interactivity missing from most household lighting solutions. Underneath the pixelated-looking paper shade is an LED bulb controlled by an Arduino hooked up to an IR sensor. Simply wave your hand over the top to turn it on and off. You can also control the brightness by holding your hand above the stylized beacon momentarily to engage the dimmer, then moving your hand up and down to set your preferred lumen level. Check out the video after the break and head on over to the source for complete build instructions. Luminch One: an Arduino lamp you control with the wave of a hand (video) originally appeared on Engadget on Tue, 03 Jan 2012 14:44:00 EST. Please see our terms for use of feeds. The holidays are all about eggnog, ugly sweaters and disconnecting from the internet just long enough to reassure the family you still care. For those of us with web separation anxiety, the folks at MAKE have hooked us up with an easy way to stay hip to incoming emails -- by connecting the holiday fir to the Internets. It works as such: using an Arduino and PHP script, the tree will check for incoming emails and light up if the number has increased. The set-up can be tweaked based on your most valued type of alert like YouTube comments, texts or changes in the weather. To the family, it will look like unparalleled holiday cheer rather than your cue to ditch the sing-a-long and get back to Gmail. Check out the video after the break. 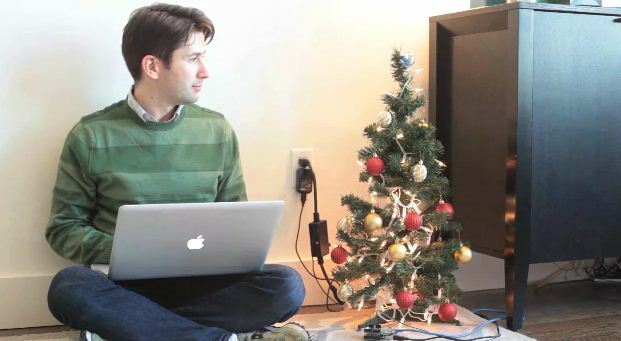 Arduino hack lights up the tree with every email, spammers get in spirit originally appeared on Engadget on Mon, 19 Dec 2011 01:09:00 EST. Please see our terms for use of feeds. Those gun-show tickets you've been offering out to everyone (that nobody ever takes) can suddenly do a lot more, thanks to Advancer Technologies. It's developed an Arduino-based plug-and-play bio-feedback game controller that uses EMG (electromyography) sensors to monitor the electrical activity in your skeletal muscles and turn them into game controls. For example, a bicep twinge represents jump, a gripped fist means run forwards -- as long as you've sufficient definition for those two to be distinctive. 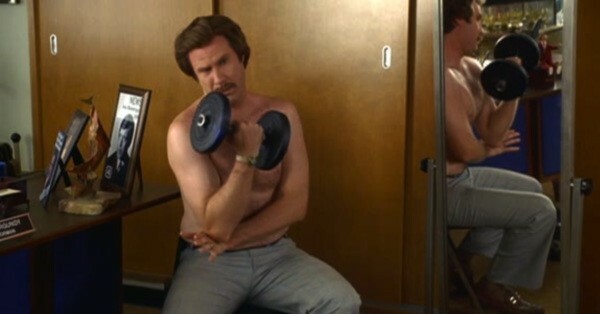 Check out the must-see muscle action after the break, or see how it's done at the source link. USB Biofeedback Game Controller lets you play Mario with your guns (video) originally appeared on Engadget on Fri, 16 Dec 2011 11:07:00 EST. Please see our terms for use of feeds.